What relationship can there be between faded jeans and a professional disease such as silicosis, traditionally associated with mining or foundry work? 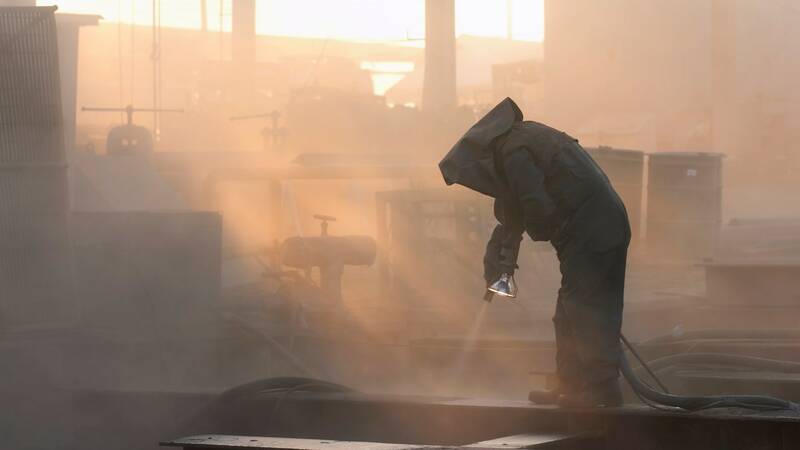 The sandblasting process with air compressors, adopted for the discoloration of this type of trousers in order to give it an aged look, is one of the processes identified as potentially harmful for workers in this industrial sector, exposed to silicosis as their forerunner in mine. Necessary to prove the etiological link with the tasks performed. This, together with professional asthma, chronic bronchitis and emphysema, asbestos intoxication, allergic alveolitis and other minor respiratory diseases, is one of the main occupational diseases of the respiratory system that can involve those working in productive sectors. Today, however, in this area it is necessary to develop and promote a "new diagnostic diagnostic procedure", since the relationship between tabulated and non-tabulated occupational diseases has shifted towards the latter, of which it is necessary to prove the etiological link between work performed and pathology. A work that starts from afar: in 1994 the first analytical sheets. This is what is proposed to spread among the insiders in a recent publication of Inail, edited by a working group of the Regional Health Superintendence of Inail Campania in collaboration with the School of Specialization in Occupational Medicine of the University of Campania "Luigi Vanvitelli" (formerly Sun - Second University of Naples) and the Institute's central health superintendence. A work that starts from afar, because already in 1994 the Inail had provided to accompany each pathology of an analytical sheet with sections specifically dedicated to the fundamental investigations to arrive at a complete diagnosis. A new model of assessment for a homogeneous treatment. As explained by the authors in the introduction, "the continuous change in the working realities and the increase in the collective awareness of occupational risks", also due to the prevention policies implemented in the last twenty years, "the updated scientific evidence and the new and refined techniques diagnosis impose the adoption of a systematic method in the detection of occupational diseases ", able to standardize their treatment in the medical field and to contribute to the reduction of diseases that are still underestimated. Mainly addressed to legal and labor doctors, technical consultants, judges, operators of the patronage bodies, the manual represents the conclusion of a research conducted by a multidisciplinary staff within the project "Iter procedural for the diagnosis of occupational diseases". The goal is the development of guidelines and operational guidelines. Aim of the project initiative, coordinated by the doctors of INAIL Pasquale Antonio Di Palma (Central Health Superintendence) and Alberto Citro (Campania Regional Health Superintendence) and chaired by Dr. Pietro Gaetano Iacoviello (Regional Health Superintendent for Campania) and by Professor Nicola Sannolo (former director of the School of Specialization of the former SUN), is the development of guidelines and operational guidelines concerning occupational diseases both in relation to the respiratory and musculoskeletal systems, which will be the subject of a forthcoming publication. An accurate analysis from the diagnosis to the health report. The editorial project involved the systematic review of already existing circulars, procedures and protocols. In addition, the guidelines developed by national and international scientific societies and those produced by medical research for each occupational disease have been revised. Each of them has been built a precise route, structured in six steps: diagnostic validation; etiological hypothesis; document acquisition relating to work exposure; medical history; diagnosis of occupational disease and functionality assessment; medical-legal considerations. The main pathologies, between old processes and new industrial applications.